We need socialism. 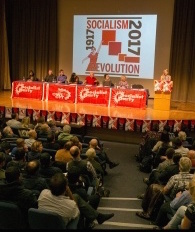 That will be the central case presented on 10-11 November at Socialism 2018 - a weekend of discussion and debate hosted by the Socialist Party (click on the link to the details at the end of this article) . It will be the key argument made in discussions covering a broad selection of topics: Corbynism, Brexit, how to kick out the Tories, the fight against low pay, the struggle against racism, and the urgency of saving the planet. We need socialism. And we need to fight for it. Socialist ideas are all about addressing the most pressing problems faced by working-class people in everyday life. They are about how we build a society that works for the majority - how we secure a future for the 99%. Socialism 2018 takes place in a world in crisis, amid a capitalist system in turmoil. It's crunch time for May in the Brexit negotiations. She is up against the clock - desperately trying to reach an agreement with EU negotiators. But even if she is able to secure a deal in Brussels, her troubles are far from over. Next she'd need to get the deal through parliament. And she'd have to do this against the background of a desperately divided party, a flimsy parliamentary majority, and with the risk of a chaotic no-deal Brexit - potentially a disaster for British capitalism - a serious possibility should she fail. In the face of this, a pessimistic attitude is wholly justified from the perspective of May and the Tories. Indeed, it is justified from the perspective of the whole capitalist class. But pessimism should not be the attitude of socialists, nor of the trade union and labour movement more widely. Because for socialists, politics is about far more than what takes place inside the walls of parliament or the closed conclaves of treaty negotiations. 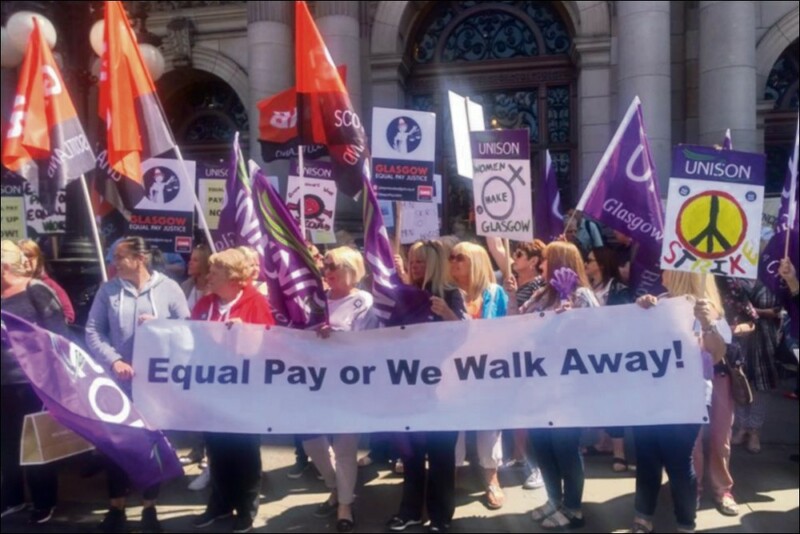 One of the key-note speakers at Socialism 2018 will be a striker from Glasgow Unison - one of thousands of mainly women council workers currently engaged in an historic battle to win equal pay. It's this kind of example that we should look to. 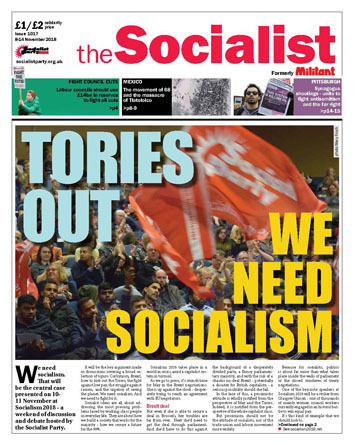 The Socialist Party argues that now is the time for our movement to go on the offensive. The election result of June 2017 left May hanging by a thread. Since then, this paper has consistently raised the need for Corbyn and the trade unions to prosecute a mass campaign, fighting to kick out the Tories and force a general election. On this score, these leaders have been found wanting. Worse, as in the case of Frances O'Grady - the general secretary of the Trade Union Congress - they have echoed arguments about what's in the 'best interests of Britain' when taking up questions like Brexit. But the truth is there is no such thing as 'British interests' devoid of class content. Do the Glasgow strikers have 'common interests' with Philip Green, Richard Branson or Alan Sugar? Low wages, privatisation and cuts to public services have all served to boost the share of wealth which goes to this small, privileged elite over the years of austerity. This is in spite of the fact that it's workers who create wealth in the first place - workers who produce goods, provide services and keep society running. Our interests and those of the capitalist class - the class which the Tory party was established to represent - are ultimately opposed. That's why the Socialist Party fights for political representation for working-class people that is independent of the interests of the capitalists. It's why we welcomed the election of Jeremy Corbyn as leader of the Labour Party - something we saw as a potential step towards this. But, since Corbyn's election, he has faced a constant barrage of attack, slander and sabotage from the representatives of capitalism in his own party. As a potential parliamentary vote on Brexit approaches, the campaign to undermine Corbyn is once again intensifying. Overwhelmingly, the capitalist class is desperate to secure a 'soft' Brexit - one in which Britain remains part of the single market and customs union for all intents and purposes. They are more than happy to sign up to follow all the neoliberal rules and pro-big-business directives that would be necessary to do this, including those which present barriers to nationalisation and state aid, for example. It's this that is the backdrop to the most recent parliamentary rebellion over Corbyn and McDonnell's position on income tax. Rightly, many working-class people were furious when Hammond's supposed 'end of austerity' provided no genuine relief from attacks on benefits, public services, or welfare - with proposed tax cuts primarily benefiting the better off. The policy outlined in Labour's 2017 manifesto, which John McDonnell has subsequently reiterated, is that people earning up to £80,000 would be protected from tax rises under a Labour government. In other words, any increase in taxation necessary to fund greater investment in public services, welfare, and so on, should come from the richest 5% of society. In line with this policy, Corbyn whipped Labour MPs to abstain in the parliamentary vote on the Tory plans raise income tax thresholds, including increasing the higher-rate threshold from £46,350 to £50,000. More than 20 MPs chose to break the whip. "We can't keep pretending that punishing the wealthy is the solution to underfunding. We need to have a truthful conversation with voters about how much we need to raise in tax to fund public services." So, as far as Hodge is concerned, the cost of funding public services must be borne not by the 1% - those who've continued to enrich themselves throughout the years of austerity - but instead by the majority of working and middle class people who have suffered. The super-rich must be forced to pay. Corbyn's quite modest proposals to increase tax on wealthy individuals and corporations are a start. But a serious approach requires that you take more far-reaching, socialist measures. After all, it's estimated that more than £33 billion was avoided or evaded in 2016 alone. The super-rich are more than adept at avoiding paying even the minimal amount of tax currently required of them. This makes nationalising the banks essential - a necessary first step to avoiding a mass exodus of capital from the country should a Corbyn government threaten their enormous wealth through taxation or other measures. But it also requires addressing the root cause of such obscene wealth polarisation: production for profit. It would only be by bringing the major monopolies into democratic, public ownership, that it would be possible to plan production to meet everyone's needs - not to fill the pockets of the rich few. Socialism is not simply a plan to redistribute wealth. It is about reorganising society to allow working-class people to democratically plan the economy - opening the door to eliminating all the waste, inefficiency and duplication created by the anarchy of the market. But Corbyn faces being held back from implementing even the most basic measures to redistribute wealth by Labour's Blairite fifth column - spearheaded by the likes of Hodge. These are the same forces potentially preparing to come to the rescue of May, and the capitalist class, by supporting a Tory Brexit deal. Corbyn has offered reassurances to the Blairite rebels that there will be 'no consequences' to having broken the whip on the income tax issue. This conciliatory attitude is particularly worrying in light of what could potentially come in the next weeks over Brexit. The Blairites are as hostile to the prospect of a Corbyn-led government as May. That explains why - at a time when the government teeters on the edge, with the potential its collapse could lead to a general election at any point - the Labour right are considering acting decisively to save May by voting for a Tory Brexit deal. This gives renewed urgency to the task of taking on the right - a fight Corbyn must lead. But doing so would involve a dramatic change of course by the Labour leadership. Ahead of a potential Brexit vote, this requires a clear statement of intent to take decisive action against any Labour MP who votes for a Tory deal. This should include the threat to withdraw the whip and 'deregister' any Labour MP who votes to save May's bacon. In constituencies with MPs who took this road, this would allow selection processes to begin which could be used to put in place Labour candidates prepared to fight on behalf of working-class people to contest the next election. Such a measure by Corbyn should go alongside fighting for demands the Socialist Party has been raising since his election in 2015: Mandatory reselection to put Labour members and trade unions in control of who represents them in elections; an opening up of the party to all genuine anti-austerity forces, including the Socialist Party, to participate in a renewed federal structure. Crucially, on Brexit - as well as all other issues - it is vital the Labour leadership adopts a clear, independent working-class stand. That means fighting for a socialist alternative to the EU, based on a rejection of all rules requiring austerity and neoliberalism and on protecting workers' rights. 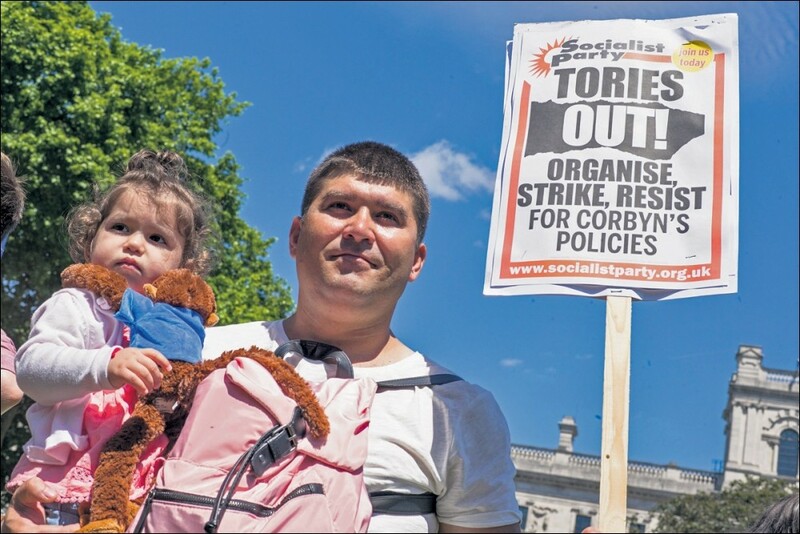 On this basis, it would be possible to win support for such a stand not just from workers in Britain, but across the continent - paving the way for a socialist Europe.